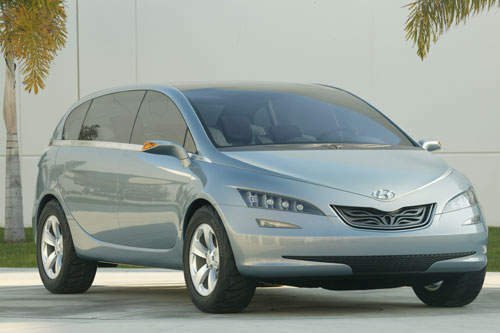 This is Hyundai’s attempt at a hybrid concept vehicle called the Hyundai Portico. It’s a people mover designed to move people comfortably. Well, at least it looks like it. It’s only a 6-seater, a suprise for me for a vehicle that looks humongous. Part of the effort to make it comfortable are the B-pillarless door hinges to make entry and exit easier. The car has a wide stance and a long wheelbase, making the interior space huge! I really don’t understand the front grill design though. Really weird. The car is powered by a combination of Hyundai’s Lambda series 24-valve DOHC V6 engine and two electric motors. A 136hp electric motor powers the front wheels and another 83hp electric motor powers the rear wheels, effetively giving the car all-wheel-drive capability.